Early in the morning while it was still dark outside, Comer Donnell, son, husband, father, grandfather, and supremely and superbly a Christian gentleman, quietly slipped away, his face turned toward a beautiful photograph of his brown-haired sweetheart, Mattie Walker Donnell. A scant month earlier his doctor had made the report: his prostate cancer, under treatment for a couple of years, had spread. In May he happily attended the Lake Junaluska wedding of his beloved sister-in-law Mary to Jimmy Ellis. In June he once again sat in Turner Field for an Atlanta Braves game. Friends and family began to notice his increased difficulty in walking and his sometimes ashen color. One Sunday he suffered a fall at church. He continued to go to Rotary and stay abreast of community affairs. It was an election year and his son was on the ballot, thankfully unopposed. He voted at the old Post Office Building, now the Election Commission headquarters. On September 15, he went to the doctor. Exactly a week later he fell again on the slick tile floor of his bathroom. Laura Anne Cason was there cleaning and she helped him to bed. He telephoned his son himself; he would never be alone again. After one night in the hospital he came home to a hospital bed and sitters and family members always in attendance. The hospital bed was placed in the den under his direction, but he used it one night and then chose his own four poster, to leave it only after he was unconscious and unknowing. He came home on Thursday, September 24, and by his next doctor appointment a week later he was too weak to go. Drs. Wells and Gill decided the time had come for Hospice. And so it went. He became even weaker; at the beginning of his last week the pain began in earnest. After the medicine was regulated to relieve him, he slept easily and then finally. Though this seems a sad account, deep joy appeared in the many visits and sweet exchanges. Carefully he left each visitor with good memories of farewell. 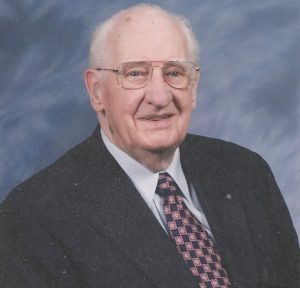 He told family members how proud he was of them, and his final Saturday found him at his dining room table with his Georgia grandsons, Martha, Tom, and Mary and Jimmy Ellis. His final visitor was a pledge to the future: young Vanderbilt football student-athlete Ryan Aulds came to tell him he wanted to be just like him. He selected hymns and made other plans for his service at First United Methodist Church at 11:00 A.M., Monday, October 19, led by Gerald Noffsinger, assisted by Loyd Mabry. Betty Smallwood played the organ and Philip Tatum sang. We are deeply honored there was a large crowd. He was born July 3, 1909, in Lebanon, the eldest son of the late Oscar A. and Jessie Marie Comer Donnell. His brothers were the late Robert Donnell of Lebanon and the late Howard Donnell of Statesville. He attended Shop Springs School and graduated from Lebanon High School and Cumberland University Law School. On August 3, 1933, he married Mattie Walker who preceded him in death, and he is survived by their two children, Comer Lewis Donnell (Anne) of Lebanon and Martha Donnell Timlin (Thomas) of Atlanta, Georgia, and five grandchildren, Edward Evans Donnell (Ann), John Comer Donnell, Michael Anthony Timlin, Stephen Donnell Timlin and John Thomas Timlin. For many years a local businessman, he had many lifelong community interests, serving as president of the Noon Rotary Club and president of the Lebanon/Wilson County Chamber of Commerce. A member of First United Methodist Church, he held local and conference level positions. After retirement he was a volunteer at McFarland Hospital and at church. Pallbearers are grandsons and nephews. Honorary pallbearers are: Dean Stroud Sunday School Class, staff and official administrative board of the First United Methodist Church, Helen Noftsinger, Tate Hutton, Theo Floyd, George Bradford, Nancy Ingram, Dr. Wayne Wells, Dr. Charles Gill and Laura Anne Cason. Visitation with the family will be Saturday from 2 to 4 and Sunday from 1 to 3 and 7 to 9. Funeral service will be 11 a.m. Monday at the First Methodist Church. Arrangements by PARTLOW FUNERAL CHAPEL, Lebanon, TN.